Paceco España, Spain’s leading provider of container handling equipment, has recently been appointed once again by PSA Sines to design, construct and assemble an STS Portainer Malaccamax crane for the expansion of its container terminal. With an outreach of 70m for 24 rows of containers and a height under spreader of 48 m, it is one of the world’s largest cranes today and has the capacity to operate with the largest container ships. Paceco España has already commenced the design and manufacturing process of this crane. PSA Sines (also known as Sines Container Terminal or Terminal XXI), located 150 km south of Lisbon, is the largest container terminal in Portugal. The facility demonstrates a sustainable growth year after year. In the first 6 months of 2017, it handled 926,216 TEU, which marks an impressive growth of 33.68% as compared with the same period last year. Partly, the surge in volumes can be explained by the dockworkers’ strikes in Spanish ports this spring, which caused shipping lines to divert their vessels to other Mediterranean hubs, one of them being Sines. Enjoying natural depths of 17m and good road and rail connections to the hinterland, the port is the preferred Atlantic gateway for Portugal and the Iberian Peninsula, handling container carriers of latest generation performing intercontinental as well as feeder routes. PSA Sines already employs 9 Post-Panamax and Super-Post-Panamax quay cranes, 8 of which have been supplied by Paceco España and one by the Japanese company Mitsui Engineering & Shipbuilding, a shareholder of Paceco Group. The terminal is presently undergoing an expansion up to an annual capacity of 2.1 mln TEU with the development of a new feeder berth of 200m to make the total quayline 1,146m. 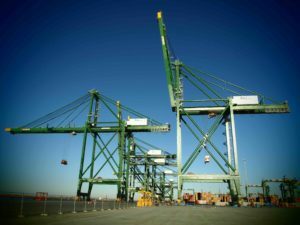 An extensive experience of Paceco España in the design of container handling cranes has made it easy to adapt its technology to the specific needs of the terminal. The proven reliability of its cranes allows the equipment supplier to accompany PSA Sines on its way to achieve their strategic aims. Paceco España is the Paceco Corp. regional supplier for Europe, Mediterranean, North and South Atlantic side of the Americas.